I'm taking the next few days off, so no Five for Friday, Awesome Weekend Videos or episodes of "Dear Mr. DeRosa" this weekend. The next posts you'll see will likely be a look back at the best of 2009 here on the site. ...and you'll only get results from this website. For some reason, it works better than the built-in Blogger search box (go figure). Happy hunting! This week's entry comes from Jessica Lepore, who teaches Spanish at The Chicago High School for the Arts in Chicago, IL. The options are limitless. This is a really inexpensive and easy way to differentiate instruction for all students. The little bucket can be picked up at the dollar store. I use simple 3x5 notecards, a Sharpie and Ziploc baggies for the individual activities. As the students learn a new concept I add a new activity to the bucket. My teaching aid also will work on keeping it up to date if I get behind - a student might even work for this and would probably enjoy it. Read more about this project here, then email your entries to teachforever AT gmail DOT com. Week 38 is scheduled for next Monday, December 28th, but there is no entry in the queue. Awesome Weekend Video #3: Should Kids Be Allowed To Have Credit Cards? Should kids be allowed to have credit cards? from Marketplace on Vimeo. Besides writing here on I Want to Teach Forever, I also write a weekly advice column for Teach for America Corps Members and Alumni called "Dear Mr. DeRosa". Back in November I started video blogging to answer reader questions, and while the original posts are on the members-only site, the videos are publicly available on YouTube. You can view all of them on my YouTube channel. There's three more "Dear Mr. DeRosa" videos, plus my "commercial" for 52 Teachers, 52 Lessons (which has now been without an entry for 4 straight weeks). I'll post updates here when there's a new video so you can join in the fun. In the meantime, you've got some catching up to do! Awesome Weekend Video #2: The Muppets do "Bohemian Rhapsody"
Chaos Reigned Supreme - Mrs. H recounts what happened when the forecast called for an amazing 1 inch of snow in temperate south Texas last week. Believing in Your Students - Awesome inspirational story from We CAN Fix Education about how simple gestures can be so powerful. Wolfram Alpha Teaches You Math, One Step at a Time - Lifehacker gives a great example of just how powerful the Wolfram Alpha engine is. Who needs TI? Cardstock Geometry Puzzle (video) - Denise of Let's Play Math tracks down an interesting lesson idea. Technology and Your Local School: What to Donate and What NOT to Donate - Wired's GeekDad blog breaks things down at a perfect time for those getting into the spirit of the season. The holidays have come early for teachers! The TeachHUB Holiday Lesson Plan Giveaway provides all TeachHUB members with unlimited access to an archive of 500+ lesson plans through January 18, 2010. All lesson plans are inspired by pop culture and news headlines, aligned to national teaching standards and are a great way to enhance existing curriculum. For more information and to access the archive of Pop Culture Lesson Plans, please visit teachhub.com/holiday-giveaway/. If you know of other great freebies and deals (or you're the one who's giving them away), please contact me so I can spread the word! I know I'm way behind the curve on this one, but I'm finally on Twitter. I've noticed a steady stream of readers coming in from the site each day, but I haven't really been able to figure out who is linking here and why without an account there. So if you're on Twitter, send me a message so we can get connected! The original Sequence Game is a classic mixing traditional cards, a board game, and a little bit of Connect Four. I'm always looking at old school games for their possible classroom applications, but I didn't see where this one would be directly educational. Recently, I learned about a new version of the game that you should definitely have in your elementary school classroom (and at home as well). 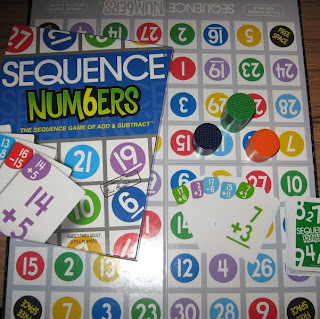 The Sequence Numbers Game allows students to practice addition and subtraction number facts in the context of an easy to learn game. The game goes like this: each player/team has a handful of these number facts cards. The game board, as you can see in the picture, has color-coded numbers that match the cards. Each turn, you can put one of your chips on the answer to one of the cards in your hand. The object is to get five chips in a row. I've played this, and watched some students play it as well, and I think this would be a big hit with kids in grades 2-5. It would make a great Christmas present for your favorite elementary teacher or student. Pick up my revised and updated book, Ten Cheap Lessons: Second Edition ($12 spiral-bound paperback, $5 digital).